Travel the length of the Nile in luxury, as you see the highlights of Ancient Egypt. Cruise from Cairo to Aswan, seeing the Great Pyramids at Cairo, the Valley of the Kings at Luxor and the High Dam in Aswan, with many other highlights along the way. Alternative itineraries are available Cairo to Luxor 12 days, Aswan to Cairo 13 days and Luxor to Cairo 10 days. Embark at Cairo, staying onboard overnight. Enjoy dinner and music. 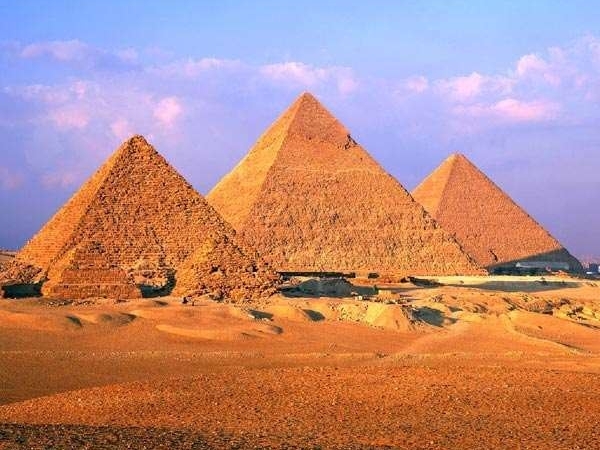 Visit the Great Pyramids of Giza and the Great Sphinx at Giza. Enter the Great Pyramid of Khufu for a journey through the 4,576-year-old narrow passages leading to the tomb containing the granite sarcophagus of King Khufu. Later, head to the Pyramid of Khafre, the Pyramid of Menkaure and the enigmatic Sphinx. Return to the ship for lunch. Spend the afternoon at the Museum of Egyptian Antiquities. With over 120,000 artefacts, the museum displays the glories of ancient Egypt. Mummies, sarcophagi, pottery, jewellery and of course King Tutankhamen's death mask are all there. Stay onboard overnight at Cairo. Enjoy dinner and takht, a music style featuring a small ensemble of Middle Eastern instruments. Visit Memphis and Saqqara, the ancient burial ground which featuring the step pyramid of Djoser. Return to the ship for lunch. Visit Coptic Cairo, a part of Old Cairo with strong Coptic associations. See the church founded in the 3rd century and known as the Hanging Church, because its nave is suspended over a passage. Visit the Coptic Museum and the Ben Ezra Synagogue. Stay onboard overnight at Cairo, with dinner and a cocktail party. A full day of sailing. Stay onboard overnight at Beni Suef. After dinner, try some Egyptian wine. Another full day of sailing. Stay onboard overnight at Minya. Enjoy dinner and music. Visit Tuna el-Gebel and the Hermopolis Magna Archaeological site at Al Ashmunin. After lunch onboard, visit the tombs at Beni Hasan, including the tombs of Baqet III, Khety, Amenemhet and Khnumhotep II. These tombs date from the Middle Bronze Age (21st to 17th centuries BC). Stay onboard overnight at Minya. Enjoy dinner and a folkloric show. After an early morning sail, arrive at Amarna. The ancient Egyptian city of Tell el-Amarna (or simply Amarna) was the short-lived capital built by Pharaoh Akhenaten and abandoned shortly after his death around 1332 BC. It was a city dedicated to Aten, the sun-disc god. Here, see the informative Amarna Visitor Centre. Visit the northern tombs, carved into the base of a cliff face. The three tombs of Ahmes, Meryra and Penthu are grouped together. See them, then walk about 400 metres along the base of the cliff to the tomb of Panehsy. The Royal Tomb of Akhenaten is entered by a steep flight of steps. A long corridor slopes down, leading to wall decorations, now faint, showing the Pharoah and Queen making offerings to Aten. Then proceed to the former city to see the remains of the Great Palace of King Akhenaten, the Small Temple of Aten and the Great Temple of Aten. The tour takes about 2:30 hours. The ship sets sail for Asyuat, pausing at the Monastery of the Great Martyr Prince Tadros for viewings from the ship. Stay onboard overnight at Asyut for dinner and a jellabiya party. A jellabiya is a traditional Egyptian garment. A full day of sailing. Stay onboard overnight at Sohag. After dinner, join in the Black and White party. After an early morning sail, arrive in El Balyana to visit one of the oldest cities of ancient Egypt, Abydos, containing the Great Osiris Temple and the impressive Temple of Seti I. Return to the ship for lunch, sailing to Nag Hammadi. Stay onboard overnight at Nag Hammadi. Enjoy dinner and a Quiz Night. After an early morning sail, arrive at Qena. Take a twenty minute drive to visit one of the best-preserved temple complexes in Egypt, the Dendera Temple complex. Return to the ship for lunch and a cookery class, while it sails for Luxor. Stay onboard overnight at Luxor. Enjoy dinner and a belly dancer show. Return to the ship for lunch. Stay onboard overnight at Luxor. Enjoy dinner and music. On the east bank, visit the Karnak Temple complex. Around thirty different pharaohs contributed to building this site, enabling it to reach a size, complexity and diversity not seen elsewhere. It was the New Kingdom's most sacred site. Next go to the Temple of Luxor. It is incredibly rich with details of the past, with stories told of the pharaohs' exploits on the pillars, obelisks and walls. Return to the ship for lunch. The ship sails to Edfu. Stay onboard overnight at Edfu. Enjoy an early morning visit to the Temple of Horus at Edfu. The well-preserved temple is the second biggest temple in Egypt. Inspect the impressive hieroglyphs. The ship sails for Aswan, to stay overnight. Return to the ship for lunch. In the afternoon, visit the Nubian Museum. Finished in 1997, this stunning museum was awarded the Aga Khan Award for Architecture in 2001. It contains thousands of antiquities and is surrounded by gardens.